Shadowlawn neighborhood of Virginia Beach/Rudee Inlet area. 3 blocks to beach. Walk to Rudee‘s and Sams. Easy access to I-64/264. Bicycle friendly community. Perfect for holiday getaways and gatherings. 2 bedrooms with queen beds and 1 twin, ceiling fans, combination living room and dining room, full size sleeper sofa in living room, off street parking, 3 car driveway, outdoor shower, grill, patio deck , private yard. Very homey, comfortable, and clean! Perfect for our family to spend quality time at the beach! 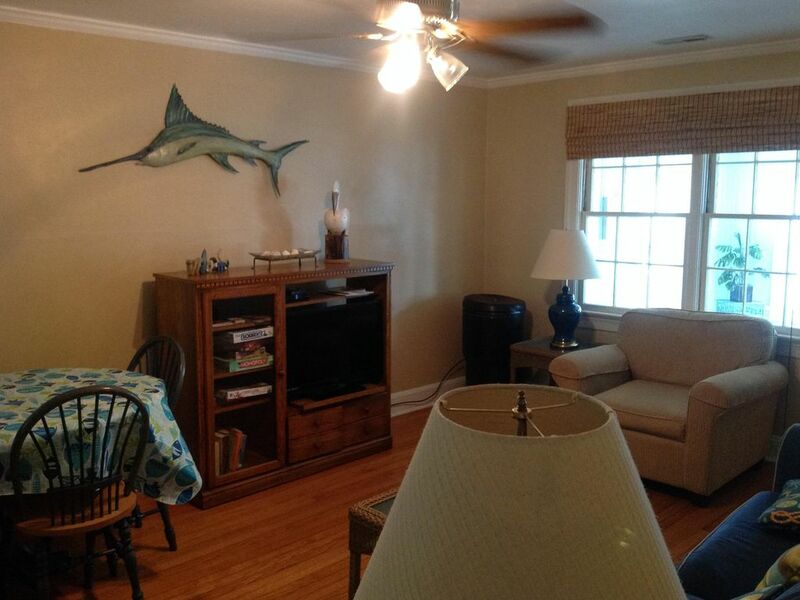 This house provides all the comforts of home and is a great location for the beach goer. The owner and manager are very easy to work and communicate with, as well as eager to help with anything. The house was very clean and provided all the amenities necessary to have home cooked meals, a BBQ (charcoal grill provided), and fun family game nights. We had a couple rainy days at the start of our trip, so we went to the Virginia Aquarium. This was a fun experience for our family and the aquarium is just about 5 minutes away by car. The walk to the beach takes about 7-10 minutes and there is an easy path that runs under the main streets. Big Sam’s seafood restaurant is a short 5-minute walk from the house and has great tuna tacos and kids food. We didn’t try the crab cakes, but people rave about them! We will try them next time. If you plan to bring food into the house, there are two grocery stores that are nearby (within a 10 minute drive depending the store) providing all types of foods. There is plenty of space in the kitchen to store all of the food belongings. Even though this is a cozy 2-bedroom house, it provided the 4 of us plenty of space for our own space/time if needed. We truly couldn’t have asked for a better space for our annual family beach vacation. Both of our boys raved about the house and experience, so it’s a win-win all around. We would definitely look into renting this house again for future vacations. Nicely updated, fully supplied and updated unit. Nice owner and nice 👍� property. Would unit that I would not hesitate to recommend this property for your beach vacation. Great location & beautiful house! The house was beautiful and well kept. My husband and I loved the location as it was so close to everything! Denny and Claudia were great and easy to communicate with. We would recommend this house to anyone and would definitely come back! The house was nice and cozy and within walking distance from the beach. With a fully equipped kitchen and laundry area it made vacationing a lot easier. The only complaint was the comfortability of the mattress. Wonderful place to stay. Very clean with everything you need! Close to beach and boardwalk. Easy walk! Would definitely come back!